For an immediate on-line quote or to make an order visit our instant price quote pages. Duplidisk a media duplicator offering CD duplication, DVD duplication and printing services to the UK. Specialising in DVD duplication & CD duplication runs of 50 to 500 units in 24 hours, and runs up-to 2500 in 3-5 days Larger CD replication and DVD replication production runs up to 25000 can be handled with ease, although they take a little longer. What is CD duplication & DVD duplication? CD & DVD duplication and CD duplication is the process of copying data onto a recordable disk. The DVD & CD's used in the duplication process are known as writable DVD & CD's. The DVD/CD-R's are short for Compact Disk Recordable and come as blank disks that can be written to. DVD CD-R's, used in the DVD duplication or CD duplication production process, are suitable for storing all types of data including PDF files, music, multimedia, images, sound, film and animation, and are as good a quality as commercially produced glass mastered disks. What is Volume CD Replication & DVD Replication? CD and DVD replication, is the process used for larger runs of media production. With a minimum order of 1000 units, replication is the most cost-effective option for major runs, reducing unit costs as quantities increase. All discs are produced from a glass master, pressed and printed. Our replicated discs are industry standard, all manufactured within the EU to provide our customers with the highest possible standard. As this involves the making of a glass master disk prior to production, it is not suitable for projects with tight deadlines. 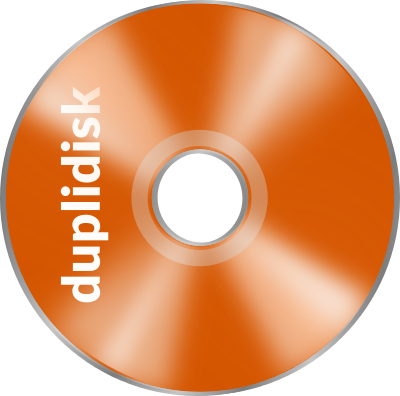 Duplidisk not only specializes in quality DVD duplication and CD duplication, but also in CD printing and DVD printing (no label - printing direct to the disk surface). Our DVD printing and CD printing, and CD duplication and DVD duplication machines feature "state of the art" technology, providing our customers with a high quality - professional product, from a top class duplicator. Full Colour Inkjet DVD & CD Printing - Matt, Glossy & Waterproof. Screen Printing for accurate pantone matched spot colour, designed around simple shapes and colour schemes. Lithographic printing is the industry standard for high-quality photographic reproduction. For designs with more complicated artwork, offset printing is without equal in terms of quality and cost effectiveness. We will, if requested, advise clients on the best option based on their design & artwork. For more information about cd printing - see our dvd printing page.